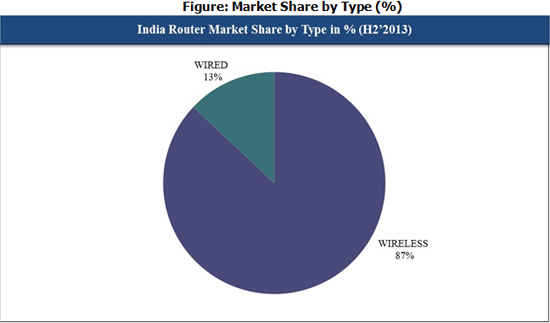 India Router market shipments volume reached 1.08 Million units in CY Q4 2013; down by 2% than the previous quarter with D-Link commanding lion’s share. 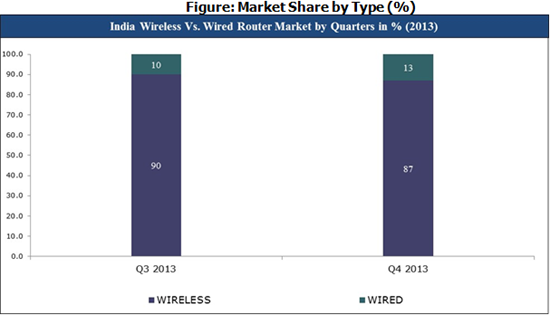 The wireless network segment dominates the Indian Router market. D-Link dominated the Indian Router market followed by TP-Link. Top 2 players collectively accounted for more than 39% of the total market share. More than 58% routers provide wireless speed up to 150 Mbps. Rising demand for feature rich routers with affordable prices is driving the growth of the mid and lower segment routers in the Indian market. The demand for cloud based services along with the networking and multitasking activities such as browsing the internet on smart phones, tablets via WIFI, watching movies, playing games with gaming consoles and other devices, have all fuelled the demand for routers in India. The market share of wireless network routers witnessed substantial increase to reach 87% in CY Q4 2013 as compared to the previous quarters, although compared to the last quarter WLAN routers registered a slight decline in the market share. On the contrary, wired network routers have registered a consistent decline over the previous quarters and totaled 13% in CY Q4 2013.